Nancy Leigh DeMoss: It’s not wrong to ask why. Leslie Basham: This is Nancy Leigh DeMoss. Leslie: This is Revive Our Hearts with Nancy Leigh DeMoss for Tuesday, June 23, 2015. Nancy is continuing in a series called "How to Have a Quiet Heart." Nancy: I’m inviting you to join me during these days in meditating on Psalm 131, internalizing it, making it a part of your thinking, a part of your responding. Just three short verses, but how rich they are! We’re looking at these verses to learn how to have and how to keep a quiet heart. Let me just read the passage. Psalm 131, beginning in verse one. Lord, my heart is not haughty nor my eyes lofty. [We said that is the heart attitude of humility. And then we saw the heart attitude of simplicity.] Neither do I concern myself with great matters, nor with things too profound for me. Surely I have calmed and quieted my soul, like a weaned child with his mother; like a weaned child is my soul within me. O Israel, hope in the Lord from this time forth and forever (NKJV). We’re looking at the second half of verse 1, and this is a phrase that has become just so much a part of my life. It’s great, and I go back to this again and again and again. I do not exercise myself in great matters or in things too high for me. I want us today to look at an Old Testament illustration of someone who learned the hard way not to exercise himself with great matters or with things too high for him. It’s the Old Testament character of Job. You know the story, and I don’t have to give you a lot of background on it. You know that this is a man who endured enormous suffering, the loss of his possessions, the loss of his family, the loss of his health. And when all those catastrophes hit Job’s life, his first response, as you read the first couple chapters of Job, was to have a quiet and a trusting heart. I mean, it’s an incredible example. He said, “The Lord gives. The Lord takes away. Blessed be the name of the Lord.” And in all of this, the Scripture says, in those early days, Job did not sin with his mouth. He did not falsely accuse God. He said, “Should God send us only good? Should we take only good from God’s hand and not evil? God is God. He can do what He wants” (paraphrase from Job 1:21–22; 2:10). That’s a quiet heart. That’s a trusting heart. That’s what we see in Job after he first began to suffer. But the challenge is sometimes not in the first flush of suffering. The test is really, how do you do in the long haul? How do you do when the suffering doesn’t stop? How do you do when your mate doesn’t come back? How do you do when it’s chronic pain or chronic suffering or chronic problems? Well, as Job gets into this suffering thing and it goes on and on and on, he begins to try and understand God’s purposes for his suffering and his pain. As he’s talking with his so-called friends, in their conversation they begin to stir up anxious thoughts within Job. And Job ends up in turmoil. He starts with a quiet heart, but he begins to ask God and his friends and himself and anyone who will listen all these questions that come flooding into his mind. It really all comes down to the question of why. Why me? Why this? Why now? Why? What happens as the book progresses is that Job begins to try and understand things that are not fathomable. And because he can’t understand, rather than being content with mystery . . .
Now, keep in mind in all fairness, he’s a man who’s in great misery. But rather than relinquishing his questions and those answers to God, he begins to strive with God. He begins to hurl his questions at God one after the other. The frustrating thing is that God’s not answering. So he keeps asking his questions. Well, this goes on for the better part of thirty-some chapters. Finally we get to chapter 38, verses 1–3, and finally God answers Job. Then the Lord answered Job out of the whirlwind and said, "Who is this that darkens counsel by words without knowledge? I will question you [Job], and you make it known to me" (ESV). Beginning in chapter 38 and following, God gives Job a comprehensive exam. I mean, it is a tough one! There are fifty-five questions, and these questions come one after the other. As I was reading these questions the other day, I just pictured one of those fastball pitching machines at a batting cage, where the balls just keep coming and coming at—I don’t know how many miles an hour—they’re coming fast! It’s like a little child having these eighty-mile-an-hour balls. He can’t get his bat on the ball. I mean, it’s just impossible. “God, You can stop sending those balls out of that machine!” But God’s not done. God has a few more questions. He wants to make sure that Job knows who’s God and who’s not. So He starts pitching balls once again. Job, “I will question you, and you make it known to me. Will you even put me in the wrong? Will you condemn me that you may be in the right?” (Job 40:7-8). And now come fifteen more questions, one after the other, one harder than the next—about the created world, about all kinds of animals that you and I have never heard of and how they function. God is just wanting Job to see that there are so many things that we can’t begin to understand. Don’t try to think that you can understand why this suffering. Then we come to the great statement of confession and repentance in Job 42, beginning in verse one. Then Job answered the Lord and said, "I know that you can do all things, and that no purpose of yours can be thwarted." [You said, O God,] "Who is this who hides counsel without knowledge?" Therefore I have uttered what I did not understand, things too wonderful for me, which I did not know. [You said to me,] "Hear, and I will speak; I will question you, and you make it known to me [Job]" (vv. 1–4). [Then Job says to God,] “I had heard of you by the hearing of the ear, but now my eye sees you; therefore I despise myself, and repent in dust and ashes” (verses 5-6). Oh, the depth of the riches both of the wisdom and knowledge of God! How unsearchable are His judgments and His ways past finding out! "For who has known the mind of the Lord? Or who has become His counselor? Or who has first given to Him and it shall be repaid to Him?” [And then that conclusion, that doxology.] For of Him and through Him and to Him are all things, to whom be glory forever. Amen (NKJV). So what do you do with your doubts? What do you do with your unknowns? Do you struggle and strive, or do you say, “Lord, You’re God; I’m not. The riches of Your knowledge and wisdom are too great for me. They’re unsearchable, past finding out. I can’t know Your mind. I can’t counsel You. You don’t owe me any explanations. Leslie Basham: Nancy Leigh DeMoss will be right back. She’s been inviting us to explore the story of Job. His faithfulness will give you perspective on any situation you're in today. That message is part of a series called "How to Have a Quiet Heart." You can listen to the entire series, read the transcript, or order a copy on CD by visiting ReviveOurHearts.com. Now Nancy is back with part two of today's program. Did any of you write that email? The passage that we’re looking at in this series, just a short psalm, Psalm 131, has a lifetime’s worth of help for people like the woman who wrote that email and for people like me and people like you. Let me read the psalm again, and then we’ll jump in where we left off the last time. The Psalmist says, “Lord, my heart is not haughty, nor mine eyes lofty.” We talked about the attitude of humility. Then he says, “Neither do I exercise myself in great matters, or in things too high for me.” That’s a heart attitude of simplicity. He goes on to say in verse 2, “Surely I have behaved and quieted myself, as a child that is weaned of his mother: my soul is even as a weaned child.” And then that third verse: “Let Israel hope in the Lord from henceforth and for ever” (NKJV). Today and in the next session we want to look at verse 2. “Surely I have behaved and quieted myself, like a weaned child with his mother." 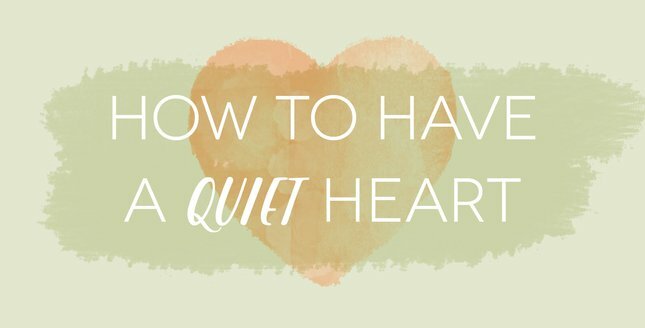 How to have a quiet heart. The Psalmist says, “I have quieted myself.” And that is so often what we need in this very busy, frantic, hectic world that we live in. How do you get a quiet heart? I see in this verse that to have a quiet heart requires a conscious choice. It doesn’t just happen. He says, “Surely I have behaved and quieted myself.” I’ve made a decision. I’ve been proactive about this. I have spoken to my heart. That’s where we need to learn to counsel our hearts, to say, “Heart, be quiet.” It’s a conscious choice. “Surely,” he says. It’s like he’s taking an oath. One writer on this psalm said, “He is bound and determined to wrestle down his unruly soul.” And I like that, because sometimes my soul really gets unruly. Now, one thing I’m learning, and I’m seeing it in this psalm, is that you have to quiet your own soul. No one else can do it for you. We tend to want somebody else to come around us and fix it or help it or make it better. People can encourage us; they can point us to the Lord. But ultimately we have to say to our own souls, “Soul, be quiet. Be still. Wait on the Lord.” This quietness is something that takes place within our hearts. It’s a change that has to take place within, because I’ve learned that you can change all kinds of circumstances in life but your heart still be in turmoil. And you can have all kinds of turmoil going on around you and still have a quiet heart, because peace is a matter of what goes on inside the heart. So I’m finding that what I have to do to my own heart is say, “Be quiet! Hush!” Now, we tend to think sometimes that we don’t have any control over our own heart, that we can’t help how we feel. We can’t help the way we’re feeling or thinking. There’s a book that has been such a blessing to me over the years, and I’ve read it at different seasons in my spiritual pilgrimage. I’m reading it again because I need it again. It’s by a writer named Francois Fenelon. It’s called The Seeking Heart. It’s one of my very favorite devotional books. The devotions are all just one or two or three pages, and you can read it in small doses. Ask God for calmness and inner rest. I know what you are thinking—that controlling your imagination does not depend on yourself. Excuse me, please, but it depends very much on yourself! When you cut off all the restless and unprofitable thoughts that you can control, you will greatly reduce those thoughts which are involuntary. God will guard your imagination if you do your part in not encouraging your wayward thoughts. You think about a nursing infant that’s dependent on its mother’s milk, its mother’s breast. But there comes a point, as that baby grows and matures, that it needs to be weaned from the mother. But as you know if you’ve weaned a child, weaning is a process. It doesn’t happen overnight. It’s not always easy, and at points it involves a struggle. “I can’t live without this! I need my mother’s milk; I need the mother’s breast!” So that child in the weaning process may whimper and cry; something is being taken away that it thinks it can’t live without. The child that has not been weaned or the child that’s in the weaning process at times can be demanding. It has to be its way. You know, it’s inherent in infants—and in grownups who think like infants—to be wired to think, I want, and I want now and not to be satisfied until you give them exactly what it wants. But once the child has been weaned, the picture is that it’s content. The child is content with whatever the mother provides. The child is settled. The child trusts that the mother will give what the child needs. God has to wean us and bring us to the place where we can live without those things we were dependent on as spiritual children. If our soul is like an unweaned child, our soul will be demanding, fretful, anxious, stressed. We get restless inside, noisy in our minds, perturbed. Do you know what it is to have a tumultuous spirit, to feel driven, to have an obsessive lifestyle? Some of us are perfectionists: firstborn daughters, perfectionists, these obsessive tendencies. That’s an unweaned child tendency. “The world has to work my way.” But if your soul is like a weaned child, your heart will be calm; it will be tranquil. The picture is of the rest that follows the struggle. First the struggling, and then the “ahh,” the rest. I’m content. I’m not anxious. One writer said, “You used to be noisy, squirmy, and demanding. Now you sit still.” That’s the picture of the weaned child. Just simple. They don’t have to figure everything out. There’s this trust. I was talking with a mom the other day who had the weight of the world on her shoulders, and she was feeling very emotional. She was just sharing with me, pouring out some things in her life. While we were talking, her little four-year-old girl came up to her, oblivious to anything that was going on in that adult world. She just came up under the mother’s arm and nestled up next to her mother’s side. It was such a sweet picture of trust and rest and contentment. But that’s so different from the way we often handle situations, isn’t it? We want to control. We want to figure everything out, manipulate, strive. My new word is hyperventilate. That’s what I find myself doing a lot; the turmoil in my mind starts to come out and I start talking faster and saying more; my pitch rises and the volume rises. It’s this stressed-out sense of my being responsible for everything. That’s not a quiet heart. That’s not a weaned child. A weaned child means quieting my heart, being still in my Father’s presence, trusting His wisdom and love. It’s not the kind of trust that pretends that problems don’t exist. But it’s trusting that our Father understands what we don’t, that He can see what we can’t see, and that He can manage what we can’t manage. It’s trusting that He is in complete control of the situation. Leslie: Nancy Leigh DeMoss has been showing you how to have a quiet heart, no matter the circumstance. Storms blow into all of our lives on a regular basis. I’ll guess a lot of women need to hear this message this week. And we need to be reminded of it as we go through storms in life. We’d like to help you keep your mind on the truth each day by sending you a devotional book by Nancy called The Quiet Place. Each day, you’ll read a short chapter and be reminded of the truth from God’s Word. You’ll be challenged to think about how it applies to your life. We’ll send the daily devotional book, The Quiet Place, when you support Revive Our Hearts with your gift of any size. You’ll help us continue providing hope for women as they go through storms in their lives. Make your donation at ReviveOurHearts.com. At the website, you’ll be able to let us know you’d like the book, The Quiet Place, or ask for it when you donate by phone. The number is 1–800–569–5959. We’ll send one book per household for your donation this week. Do you ever worry about the future? Tomorrow, Nancy shows you how to have a quiet heart even when you don't know what's ahead. Nancy: If God chooses to bring better circumstances in my life, I say, "Thank You, Lord, what a blessing. I'm grateful." But if God doesn't change my circumstances, I say, "Thank You, Lord. I'm blessed. I'm grateful. You are still good." Either way, I don't blame God. I don't blame His providence. Leslie: Please be back for Revive Our Hearts. Revive Our Hearts with Nancy Leigh DeMoss is an outreach of Life Action Ministries. All Scripture is taken from the English Standard Version unless otherwise noted. Previous Program Is Your Heart at Peace?